Biscotti: Biscotti (literally means: twice cooked), also known as cantuccini (English: coffee bread), are twice-baked cookies (or biscuits) originating in the Italian city of Prato. The biscuits are oblong-shaped almond biscuits, made dry and crunchy through cutting the loaf of dough while still hot and fresh from baking in the oven.”Biscotti” is the plural form of biscotto. 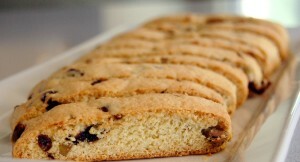 Since they are very dry, biscotti traditionally are served with a drink, into which they may be dunked. In Italy they are typically served as an after-dinner dessert with a Tuscan fortified wine called vin santo. In a medium bowl, whisk together flour, cornmeal, baking powder, and salt. In the bowl of an electric mixer fitted with the paddle attachment, cream butter and sugar on medium speed until light and fluffy, takes about 2 minutes. Beat in orange extract and orange zest. Beat on low speed until just combined. Beat in dates, almonds and anise seeds, to form the biscotti batter. Preheat oven to 350 degrees, with rack in center. Transfer the biscotti batter to the prepared baking sheet. Using your hands, pat the biscotti batter into a slightly flattened log, about 15 by 4 inches. Bake until firm and lightly browned, and top is slightly cracked, takes 30 to 35 minutes. Let cool on a wire rack for about 15 minutes. Transfer it to a cutting board. Using a serrated knife, cut log crosswise into 1/2-inch-thick slices. Arrange on a wire rack on a rimmed baking sheet. Bake, rotating sheet halfway through, until slices are just turning brown around the edges, takes about 15 to 18 minutes. Biscotti are ready to be served.